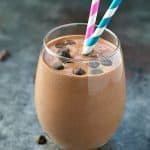 Loaded with chocolate, peanut butter and banana, this 5-Minute Chunky Monkey Protein Smoothie is a healthy breakfast or satisfying snack to fuel you through your day! Add all ingredients to a blender and puree until thick and smooth. Garnish with chocolate chips, if desired. Serve immediately! For purposes of calculating nutrition information, I used my favorite IdealLean Chocolate Brownie Protein Powder (which has 80 calories per scoop). You can substitute with a different protein powder, but the nutrition information may vary. Nutrition information does not include optional toppings.